The Greatest and Most dangerous Bounty Hunter in the galaxy is this week’s selection of Character Spotlight…the Mandalorian warrior Boba Fett. A faceless enforcer, Boba Fett’s distinctive, customized Mandalorian armor strikes fear in the hearts of fugitives. He is a legendary bounty hunter, accepting warrants from both the Empire and the criminal underworld. He is all business, laconic, and deadly. 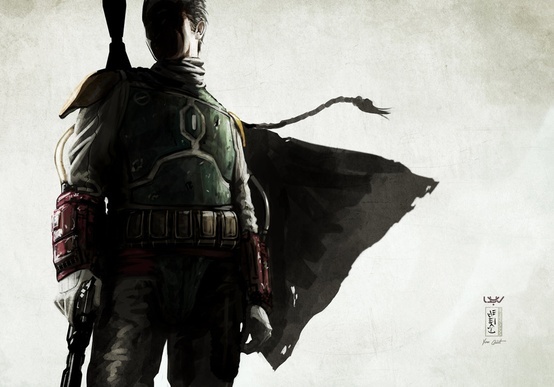 Fett has carefully guarded his past, cultivating a curtain of mystery around his origins. He is in truth a clone, an exact genetic replica of his highly skilled “father,” Jango Fett. From Jango, Boba learned valuable survival and martial skills, and even as a child he was proficient with a blaster or laser cannon. With Jango’s death at the hand of Jedi Knight Mace Windu, Boba would forever harbor a deep hatred for the Jedi and their allies. Boba Fett was a Mandalorian warrior and bounty hunter. He was aclone of the famed Jango Fett, created in 32 BBY as the first of many Fett replicas designed to become part of the Grand Army of the Republic, and was raised as Jango’s son. Jango taught Boba much, training him to become as skilled bounty hunter as his father-figure was before him. In 22 BBY, Jango was killed at the Battle of Geonosis, which opened the Clone Wars. Just a boy, Boba was forced to grow up and took to traveling the galaxy. Later, he became a bounty hunter and took assignments from beings such as Jabba the Hutt, and achieved notoriety despite his young age. When the Empire was formed in 19 BBY, it was the perfect environment for Fett. During this time, he also married Sintas Vel and had a daughter named Ailyn Vel. 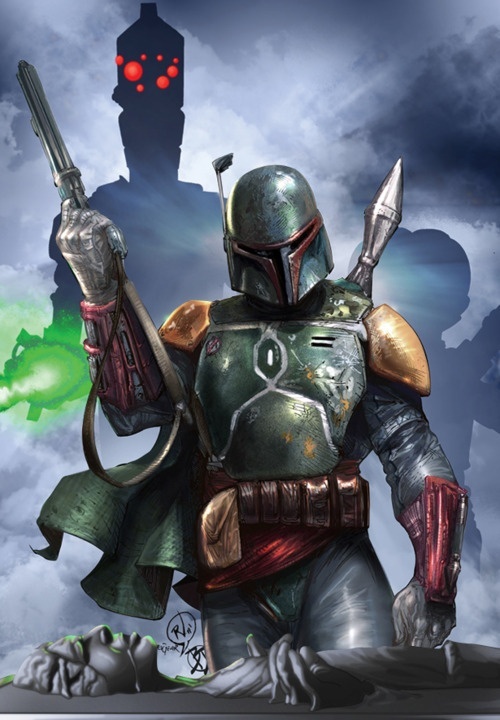 Fett became known as the galaxy‘s best bounty hunter of the next several decades, often working for the Empire. He collaborated with Darth Vader on several occasions, and the Sith Lord even developed a begrudging respect for the bounty hunter. In 1 BBY, a year after the Galactic Civil War had begun, Fett was hired to kidnap the Rebel captain Juno Eclipse to use her as bait to lure the clone of Galen Marek. He participated in the Battle of Kamino and when Darth Vader was captured and ready to be interrogated on Dantooine, the Mandalorian bounty hunter followed the Rogue Shadow on the way there. 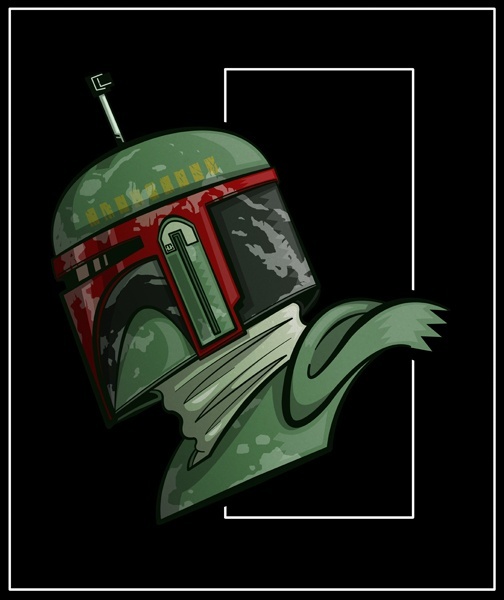 Fett made his most notable bounty in 3 ABY, when he captured Rebel hero Han Solo, and brought him to Jabba. A year later, during the Battle of the Great Pit of Carkoon, Fett fought against the group of Rebels. However, he was knocked into the mouth of the Sarlaccby Solo. Though no one in recorded history had ever escaped from the Sarlacc, Fett was able to escape, although not entirely unscathed. 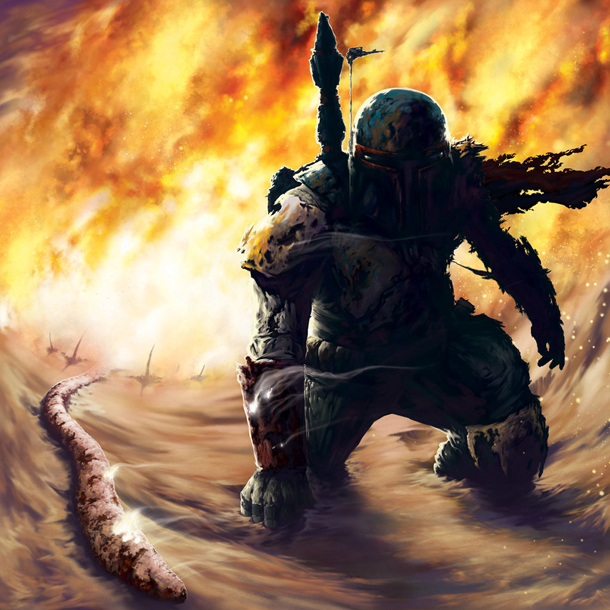 Thanks to his iron will and Mandalorian armor, he was able to fight his way out of the beast’s belly, killing the Sarlacc. Back in action, he continued his work as a bounty hunter. After a promise made to a dying Fenn Shysa, Fett becameMandalore and eventually led the Mandalorians through the Yuuzhan Vong War. Originally working as a mercenary for the invaders, Fett later helped the New Republic in their battle against the extragalactic aliens. 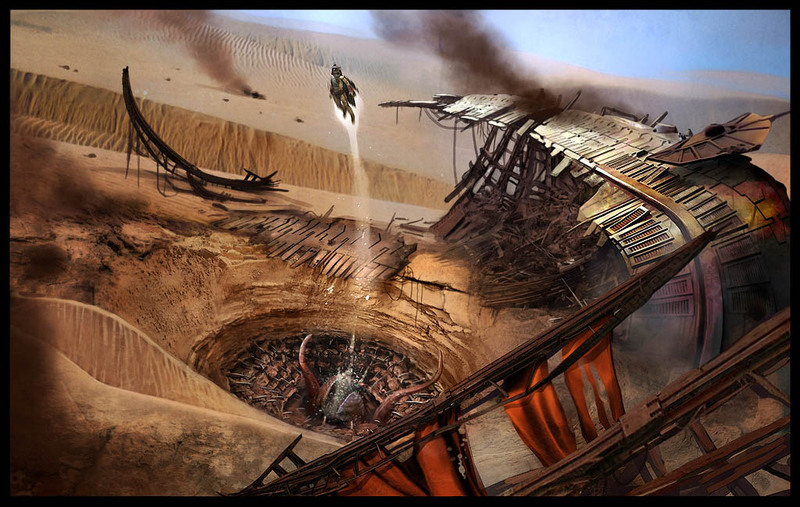 When the Yuuzhan Vong assaulted Mandalore and bombarded the surface, a large deposit of Mandalorian iron was unearthed, ironically helping strengthen the Mandalorians. Later, during the Second Galactic Civil War, Boba, who was still leading the Mandalorians, was plagued by his ailing health. He found his granddaughter, Mirta Gev, and the two went on many missions together, even alongside Han Solo. Fett also trained Solo’s daughter Jaina to kill her twin brother, Darth Caedus, and assisted the Jedi Coalition in several battles. 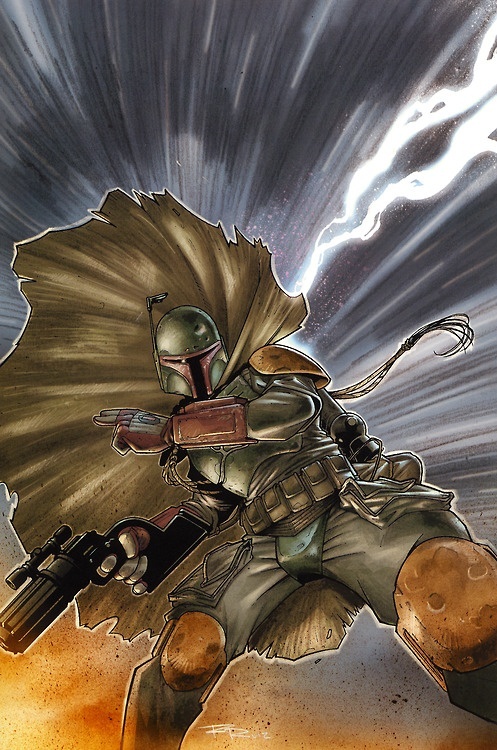 Ultimately, Fett’s training helped Jaina bring down Caedus, though anImperial nanovirus attack prevented Fett from ever returning to Mandalore. 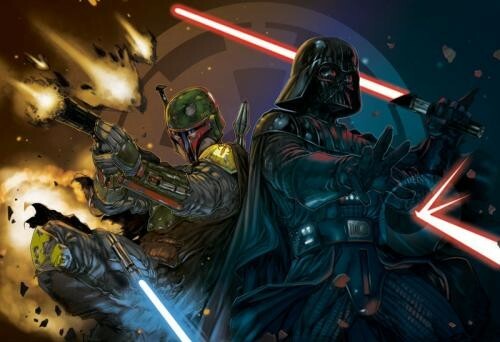 Darth Vader considered him to be the best bounty hunter in the Galaxy (in some instances, Fett was even to be referred to as Vader’s “right-hand man”). Fett was aware of that opinion and it generally emboldened him to occasionally converse with the Sith Lord with a more confrontational tone that no one outside Emperor Palpatine or Grand Moff Tarkin would dare take with him. 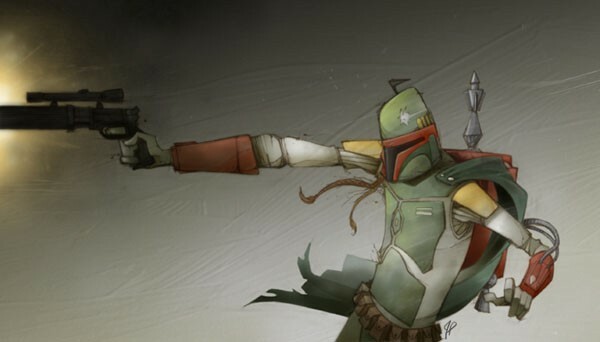 Fett was often found to be very cunning and witty like his father, but at a much more emphasized level. Throughout the many years of his bounty hunting career, Fett developed a strong sense of justice, moral obligation, and adhered to his own code of honor. He took only certain bounties that agreed with his own beliefs and brutal justice. But to those few, he whole-heartedly devoted all of his magnificent skill should the occasion call for it. This led him to believe in a quick, clean kill. Despite his animosity with the Jedi, he apologized to his brief friend Jax, only leaving him and the rest of the clone cadets to die at the insistence of Aurra Sing. He also told Aurra that while he wanted to kill Windu for Jango’s death on Geonosis, he did not wish the crew of the Endurance any harm. Prior to the destruction of the Endurance, he incapacitated a clone trooper while infiltrating the reactor core, assuring him to not be worried about dying, which possibly meant that Fett harbored some sort of attachment to his clone brethren. 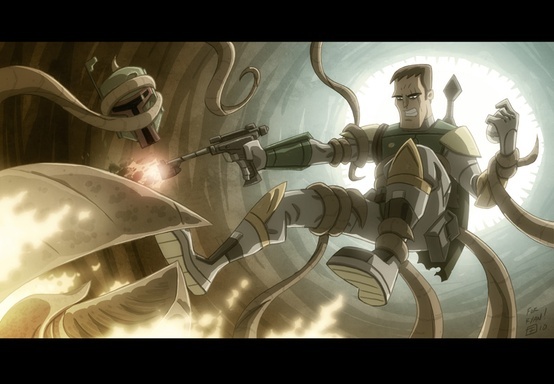 However, he did not consider himself a “clone”—not in the same sense as the “modified and disposable” clone troopers. Regardless of whatever sentiment he might have felt for the other Fett clones, Boba Fett accepted a job as the mission commander of the 501st Legion during the Kamino Uprising—a battle that saw the complete extermination of rebel clones grown from the Jango Fett template. Fett was also an expert marksman and had access to considerable weaponry. Despite having this high-tech arsenal, he was not dependent on it. 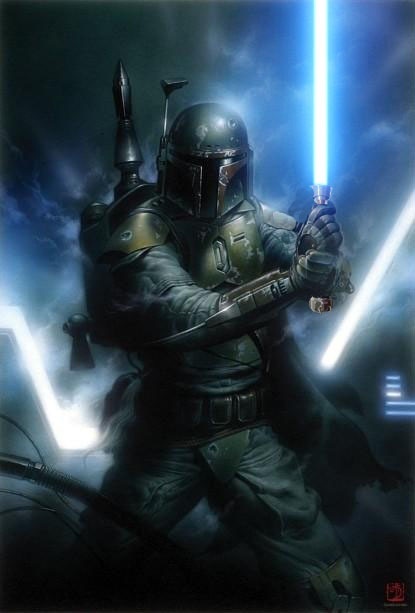 In his search for the Butcher of Montellian Serat, Fett had to capture him without his armor, equipped only with a bow, some arrows, and a crystal knife, due to electronic detecting equipment installed on the Devaronian‘s compound. He was dedicated to whatever job he was doing, and would often suspend grudges if it meant completing his mission. Also, during his time with the Clone Youth Brigade, he was able to shoot down all of the targets with one shot each on the Endurance, while the other members couldn’t even hit the targets. As a boy, he was much more enthusiastic and open-minded until his father’s death at Geonosis. The death of Boba Fett’s father at the hands of the Jedi named Mace Windu, inspired within Boba a deep-seated animosity against not only Mace, but all Jedi. But despite this, he seemed to have compassion for the rest of the Clone cadets, as he was shocked to find out that he had to abandon Jax, Hotshot, and Whiplash. The events following that tragedy shaped and scarred his life forever, resulting in a man who never went anywhere without his armor and weapons. He paid close attention to all details and double-checked his surroundings to calculate the best option to solve a problem. This helped Fett get the drop on IG-88 on Cloud City, who had placed a tracking device aboardSlave I prior to take-off to intercept Solo. As an adult, Fett was very puritanical, and claimed he had not so much as held a woman in his arms, possibly as a result of his failed marriage. As an adult, Boba Fett stood 1.83 meters tall. He was garbed in traditional Mandalorian armor with a string of Wookiee scalps at his shoulder. Despite his weapon-laden suit of armor, Fett was a subtle hunter and relied as much on his cunning and intelligence as on pure muscle and combat skill. 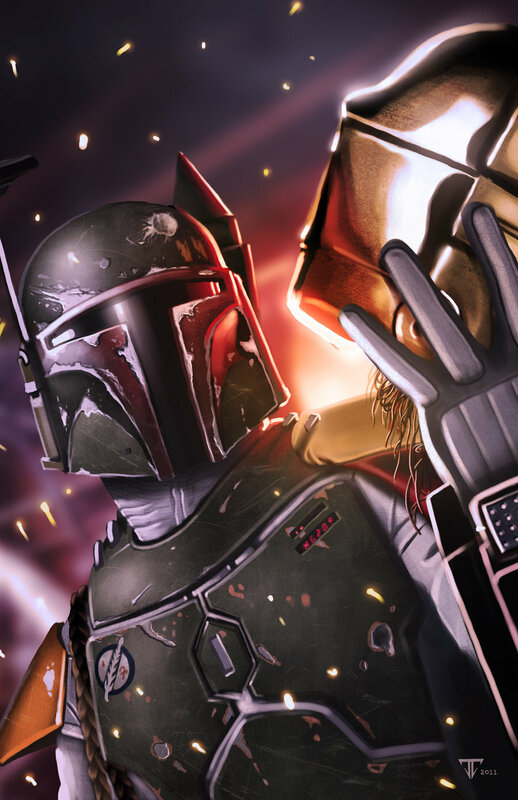 Speaking with a raspy, gravelly voice, but still retaining his father’s accent, Fett allowed few to see his face and even fewer to know his origins, giving the hunter a mysterious aura and a psychological edge over his prey. The bounty hunter Xasha was one of the only people to whom Fett showed his face. Though Boba was a perfect genetic clone of Jango Fett, a different lifestyle produced some changes from his father’s appearance: while Jango was focused on combat skill, Boba’s emphasis on cunning over muscle gave him a thinner build. Even with the thinner build, Boba Fett was usually operating at amazingly strong Human fitness. He had enough strength to hold Bossk, an infamous Trandoshan bounty hunter (whose species was known for its brute physical power) at bay. Very few in the Galaxy were as skilled in physical combat as he was. At one point, he even engaged Darth Vader in a personal combat, and while he did not exactly hold his own, his cunning enabled him to shoot Vader in the head (though unfortunately for Fett, because of his helmet, Vader was one of the few people this wouldn’t work against) before Vader brought his considerable Force powers to bear. Boba Fett’s Mandalorian helmet recorded video and played it back on command, dispensed water, compensated automatically for low or high light conditions, picked up on minute sounds and amplified them and could connect with the onboard computer of Slave I, assuming the transmission wasn’t blocked (by being underground inside the Sarlacc, for example). The helmet at one point also had the capability of sealing to compensate for pressure changes, and holding 5 to 10 minutes of air, though damage may have disabled this feature at some point. The helmet also contained a retractable straw, allowing Fett to drink without removing his helmet. Like most Mandalorian helmets, it had a T-shaped visor. 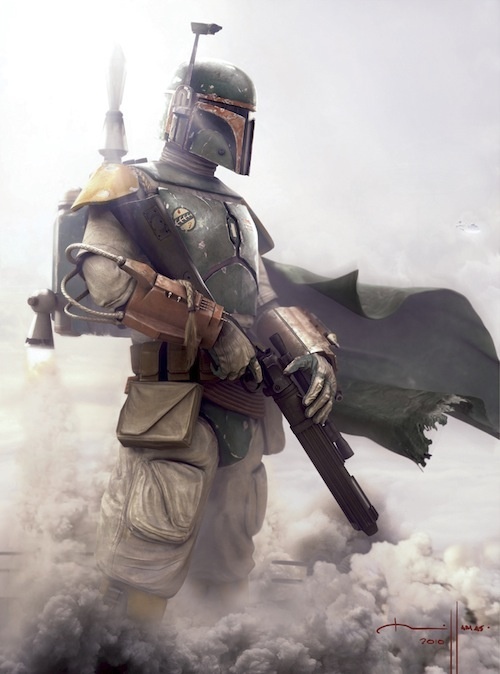 Fett could control weapons, sensors, and his jet pack with verbal commands. His helmet’s HUD (heads-up-display) featured information on the surrounding environment as well as a 360-degree field of vision. The HUD’s data streams could be controlled by eye movements and blinking. In addition, an advanced penetrating radar allowed his HUD to provide information on nearby rooms, and could be used to scan the HoloNet and connect with databases, allowing him to perform tasks which would normally require a computer terminal, such as searching databases for individuals or even trading on the stock market and buying real estate, from anywhere that was accessible through the HoloNet. 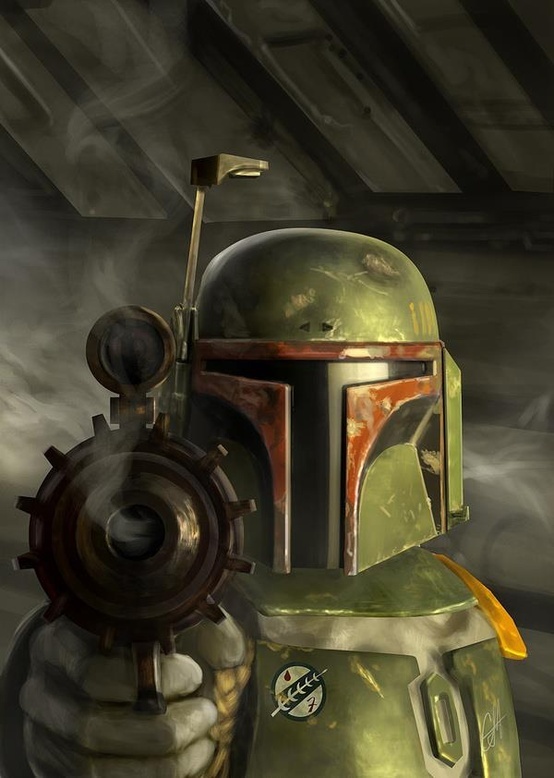 The macrobinocular viewplate could be magnified to allow Fett to see great distances, and was equipped with, among other things, an infrared scanner that could be magnified up to 50 times. The infrared scanner magnified light up to 100 times or displayed heat gradations. The helmet’s broad band antenna was capable of intercepting and unscrambling comlink and starship comm transmissions. Also, with assistance from his ships computer, jamming transmissions or sending fake transmissions, even while not in his ship. At the top of the antenna was a rangefinder capable of tracking up to 30 targets from a distance of 100 meters. The rangefinder fed data to a display overlay inside the helmet showing range and movement for targets in a 360 degree radius. The overlay also linked to Fett’s weapons systems to display fire vector and range data. The rangefinder could be deployed horizontally or vertically. Fett’s Mandalorian armor was originally constructed from duraplast, allowing it to sustain a great deal of damage without degrading. His armor also had two shoulder pads which were orange, like his kneepads. The left shoulder pad exhibited the Mandalorian skull logo, while his right chest plate displayed an emblem of unknown origin. However, the symbol was also seen on Jaster Mereel’s ship and on the helmet of at least one clone trooper pilot at the battle over Coruscant, during the Clone Wars. Fett wore a power armor liner. This liner shirt had a micro energy field projector and two layers of thin ceramic plates, in order to disperse physical and blast impacts, reducing injuries and likelihood of knockdowns. The power liner also gave him increased protection from fire, acid, intense heat, and cold. His main clothing was a reinforced armor mesh battle/flight suit. The inner lining of the suit blocked poisons and corrosives for a period of time. This suit had pockets on his hips and thighs (one on each side). Fett wore a leather utility belt that usually had ten leather pouches (but sometimes less). Below this he wore a Journeyman Protector honor sash. Attached to his right shoulder were three braided Wookiee scalps. The battle/flight suit had pockets on his shins which contained an anti-security blade, a survival knife, a jet-pack adjustment tool, and a sonic-beam weapon. Fett wore spats around his ankles to help prevent debris from going into his boots. They were smaller than standard spats, were made of a light colored cloth and attached behind the ankle as opposed to under the boot. 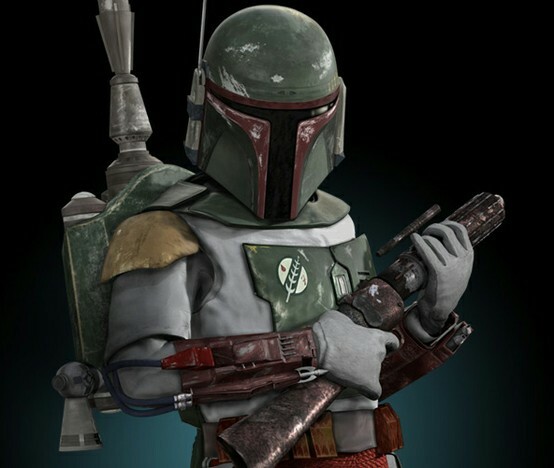 Fett wore a pair of versatile boots that had two spikes attached to the front of each. Fett wore a Mitrinomon Z-6 jetpack. The fuel tank held enough fuel for three 20-second blasts, 20 three-second blasts or one minute of continuous operation. Each three second blast moved Fett up to 100 meters horizontally or 7 meters vertically. Fett could reach a top speed of 145 kilometers per hour with a maximum range of two kilometers. Directional thrusters featured gyro-stabilizers to apply counter-thrust for maneuvering and landing.Fett’s jetpack. The top of the jet pack had a turbo-projected magnetic grappling hook with 20-meter lanyard (replaceable with 100 meters). A winch inside the launcher could lift up to 100 kilograms. The grappling hook unit was replaceable with an anti-vehicle homing missile. Fett’s main weapon was a EE-3 carbine rifle, more powerful than a stormtrooper’s blaster. It was outfitted with a scope for sniping and a fast draw shoulder sling. It fired in short bursts for more accuracy and power. A later version of the EE-3 had hand grips going lengthwise down the barrel. Boba Fett used two different sidearms during his time as a bounty hunter. The first was a blaster pistol that was similar to one of the two used by his father Jango Fett. The other sidearm was a concussion grenade launcher that included a short shoulder stock for stability and accuracy when firing. Fett kept these smaller guns in a holster on his right hip though didn’t equip both sidearms at the same time. Boba Fett’s wrist gauntlets were a mounting point for many of his weapons. His left gauntlet had a Czerka ZX miniature flame projector, which creates a cone of fire five meters long and one meter in diameter. It had a corded fuel line connecting to a backpack canister holding fuel for three minutes of operation.[source?] Directly below this was the Dur-24 wrist laser. Comparable to a blaster rifle in power, these wrist lasers had a range of 50 meters. Originally exposed, a protective shield was later added to the left gauntlet enclosing and concealing both weapons. He also carried a Tenloss DXR-6 disruptor rifle. Fett’s left gauntlet also had a Kelvarex Consolidated Arms MM9 mini concussion rocket, which utilized computer target tracking. Fett usedType-12A anti-personnel rockets, Type-12B stun rockets, and 1126 rockets. Fett’s right gauntlet had a fibercord whip with a grappling device: a 20-meter-long fibercord whip used to entangle and immobilize a target. It also held retractable vibro-blades and a dart launcher. Fett also had knee pads with rocket dart launchers. These small launchers used Malkite themfar or Fex-M3, molecular acid, stun agents, or explosive tips. Fett was known to have used a modified Wing-Blast rocket pack. The Wing-Blast rocket pack transformed the user into a flying weapons platform capable of operating in deep-space as well as planetary atmosphere. Fett was known to occasionally carry with him one of the several lightsabers he had taken from Force-sensitives over the course of his bounty hunting career. Despite having no sensitivity to the Force, Fett is one of the few non-Jedi/Sith capable of using a lightsaber (albeit, with only basic skill), a feat traditionally reserved for Force-sensitives only (see lightsaber for more info). In the several instances that he has been shown to use a lightsaber, it has usually been as a last resort in fighting Force-sensitives (not being his primary weapon of choice) and usually as a form of surprise attack as it would be unexpected from someone who was not Jedi or Sith. Videos on why Boba Fett is the MAN!! !